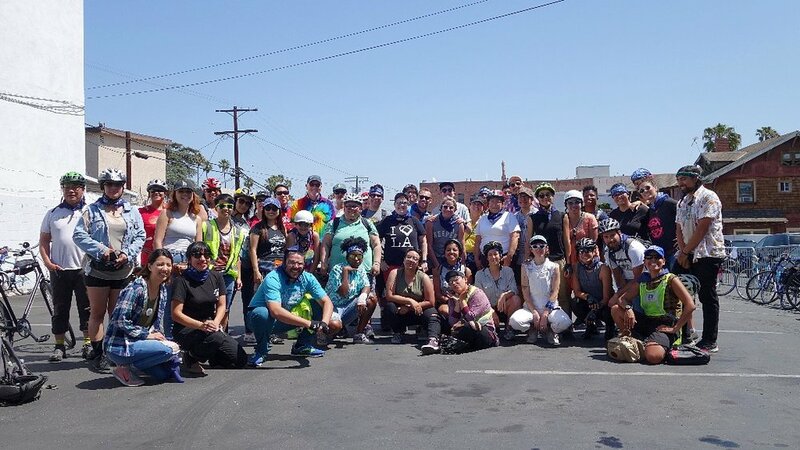 Pedal Pulse Pride Bike Ride! We were all so honored to ride our bikes in remembrance of our QTIBIPOC and LGBTQIA+ ancestors, elders, and young elders. The day began with a surprise visit from Jewel Thais-Williams, an elder in our community who started Catch One and the Village Health Foundation which are both landmarks and important spaces that were created for our communities particularly for the Black and African-American LGBTQIA+ communities. Our opening talk was lead by our Two-Spirit relatives from Three Arrows Healing Circles who offered our ride blessings and a prayer song. We then rode our bikes to honor Victoria “Viccky” Ramos Gutierrez, a transgender woman from Honduras that was murdered earlier this year. We were able to learn more about Viccky from Erika from Translatin@ Coalition who spoke of Vickky and the work Translatin@ Coalition is doing to provide support and resources to other Trans people. Our ride ended at ONE Archives in USC, home of the oldest and largest LGBTQIA+ archives in the Western Hemisphere. At this time we also remembered our 49 angels from Pulse Orlando and gifted the archives the flags made on behalf of these ancestors. Our day was filled with tears, laughter, joy, unity and solidarity. We plan to make this an annual ride and hope you can make it out next year! People for Mobility Justice, a project of Community Partners © 2018 All Rights Reserved. PMJ works primarily in the ancestral territories of the Tongva, Tataviam, and Chumash peoples, the region today known as Los Angeles.